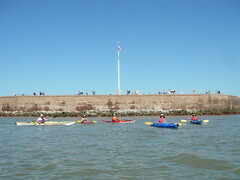 Kayak in the beautiful waters of Charleston harbor and the low country. See historic sights like Fort Sumter, where the first shots of the Civil War were fired, and the quaint city of Charleston. We'll also visit some of the surrounding creeks and rivers, wildlife preserves, low country wetlands and beautiful sandy beaches. Accommodations will be a seaside home in nearby Folly Beach with plenty of room to spread out and relax. A great April getaway you won't want to miss. Date: Sunday, April 28- Friday, May 3. Price includes: 5 nights lodging, breakfast and lunches each day, 3 days of kayaking (one day will be left open for exploring other activities in the area), equipment as needed, and guide. Cancellation Policy: full refund up to 2 months prior, no refund after March 15. 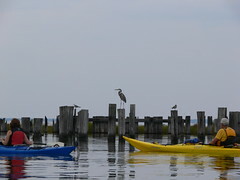 2 1/2 days of paddling on beautiful Chesapeake Bay. Relaxing, peaceful nights at historic Wades Point Inn on the Bay. 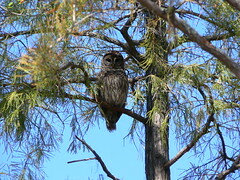 Bald eagle, osprey and great blue heron abound and we're sure to spot many on our journey. In the evenings we'll enjoy the Eastern Shore's freshest seafood as local watermen harvest the bay's bounty daily. B&B Reservations Sept 20 & 21; kayak days Sept 20, 21 & 22. B&B Reservations Sept 23 & 24; kayak days Sept 23, 24 & 25. Price includes: 2-nights lodging, breakfast, lunch, equipment as needed, and guide. Cancellation Policy: full refund up to 2 months prior, no refund after August 15. Experience the beauty and solitude of Okefenokee Swamp and you may never want to get back to civilization. Wildlife abounds here where you are sure to see plenty of white ibis, sandhill crane, american alligator, barred owl, river otter and a host of other animals that call this area home. During the day enjoy some easy flat water paddling through vast prairies teeming with birds and forests of cypress trees draped with spanish moss rising straight up out of the water. At night we'll camp out under starry skies on elevated platforms and protected back country sites while hooting owls and other sounds of nature lull us into a restful sleep. Get your group ready for this awesome trip. This trip is available to groups of up to 6 people for a 3 - 5 night stay. Best times to schedule your trip is Nov 1 - Dec 15 and Mar 15 - Apr 15. Temperatures are moderate during these times and insects are at a minimum. Cost will be determined by group size and trip duration. Included in the cost are kayak, paddle, pfd, tent, and meals.